During the Pittsburgh and Baltimore games in weeks nine and ten last year, it became crystal clear to me that the Redskins were simply overmatched on the offensive line of scrimmage. As a result, I have been thinking (okay borderline obsessing) about how the Redskins stack up against the NFL in those areas ever since, and the notion I’ve had in my head is that the Redskins were not only older than most teams on the line, but smaller as well. 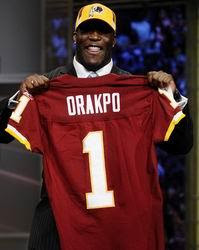 Taking a quick break, therefore, from pondering the combination of offensive tackles, defensive ends and linebackers the Redskins will surely draft later this month, I thought I would put that unsubstantiated impression to the test. Setting aside for today the comparative skill levels of the players involved, as well as how their skill sets might fit the schemes they are being asked to run (a factor in the transition from a Gibbs/Saunders offense to Jim Zorn's that cannot be overlooked), I started by looking at the three other NFC East teams. It is inescapable—those games are generally the barometer for success in any given season. The Redskins play six combined games a year against the Dallas Cowboys, NY Giants and Philadelphia Eagles, comprising 37.5% of their regular season schedule. Fare well in those six games, 4-2 or better, and we are probably looking at a burgundy and gold playoff season. Fare poorly and we are almost definitely looking at January basketball. Shudder. Hypothesis: compared to rest of the NFC East, the Redskins are old and undersized on the offensive line. Data source: NFL.com team depth charts, 4/7/09. Note: I acknowledge the depth charts are not up-to-date; some players listed are no longer on their respective rosters, others have been added. Given the fluid nature of team rosters at the moment, it was practical to look at the depth charts as they were at the end of the 2008 season. In addition, this exercise is less about predicting what will happen in 2009 than assessing where each team was the last time it took the field of play in anger. If nothing else, it should give us some idea of how the teams in question were constructed. And for those already saying, "Yeah, but Derrick Dockery (28, 6-6, 330) for Pete Kendall changes everything ..."
The results will come as no surprise to those who follow the team—particularly not the age (oldest by 2 years). They may or may not be surprised to learn that of the four NFC East teams, the Redskins were also on average the lightest (by avg. of 24 lbs. ), though they are even with Dallas and Philadelphia in average height (6-5 to NYG @ 6-3) among the starting offensive lines. And since we already invoked the Dockery factor ... plugging his numbers in place of Kendall's, the Redskins are tied for oldest (w/ DAL @ 31), tied for tallest (6-5 to NYG @ 6-3), but still by far the lightest (by avg. of 15 lbs.). Interestingly, the second-string shows Washington just about even. At an average of 27 years old, age-wise they are tied with the NY Giants (although Fabini, at 71, pretty much blows out the average). Height and weight-wise, however, at 6-4, 312 lbs., they are right in the mix. Which reminds us again that this specific exercise calls for setting aside the players’ relative skill levels and experience—the latter being particularly true in the case of “depth”players. All that said, bottom line I don't think it is any coincidence that late in games, late in the season and just when matched up against the NFL’s elite defenses, the Redskins offensive line plain and simply looked overmatched. Add to that the fact that not one of the Redskins starting five in 2008 (or currently projected to start in 2009) were initially brought in with skill sets targeted to running the West Coast Offense, and the only real surprise in 2008 might have been that the OL helped the team get off to the 6-2 start to begin with. By midseason, as defenses studied enough film to cover any confusion over Zorn's new schemes and were able to start defending the Redskins aggressively, as the element of surprise was lost so was the line of scrimmage. What was also appeared clear down the stretch was that the Redskins were fielding an offensive line that was at best average, and at worst, slow, worn out and ineffective. We all know age and size are only part of the equation. If the Redskins OL was older and smaller than the opposition but as individuals all playing at Pro Bowl level, we wouldn't be having this conversation. Sadly, they were not, and so we are. The data confirmed my impression that the Redskins OL was, and as of today still is, not just arguably too old to be effective over the course of a long season, but also, by a noticeable margin, the smallest in an historically smashmouth division. Hate to say, it but ... size matters. To explore the idea further I plan to get into the skill-level question in a subsequent piece, but first will be comparing the 2008 Redskins OL by age and size to a broader NFL cross-section—the teams that qualified for the playoffs. I hope to find otherwise, but my instinct is that we will find the Redskins firmly planted in the older, smaller end of the spectrum in that company as well. And in case anyone is wondering, yes, I also plan to also conduct a similar exercise with the other side of the line of scrimmage. Until then, though, if you happen to be partial to the burgundy and gold, please consider deploying any karmic ammunition you might have at your disposal and join me in beaming it directly toward the quiet D.C. suburb of Ashburn, VA.
"Draft big ... draft big ... draft big ..."